A Clinician's Journey from Complex Trauma to Thriving is an anthology of articles by Rev. Sheri Heller, LCSW. Written for survivors and clinicians this collection was inspired by Rev. Heller's unrelenting struggle with recovering from complex ptsd rooted in systemic and generational child abuse, and her commitment to devoting her life to helping others similarly afflicted. 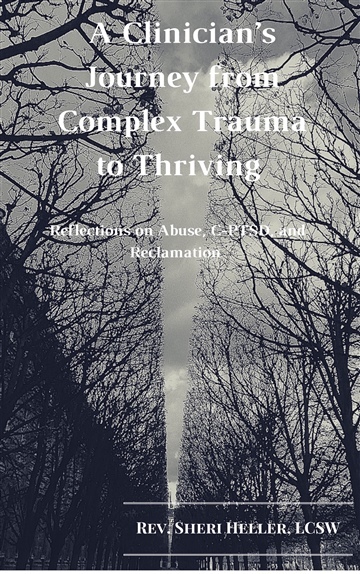 Spanning the trajectory from abuse, complex trauma, addictions, the relational quest, recovery and treatment, and ultimately thriving creatively and spiritually, this assortment of writings offers a comprehensive assessment of the healing process and the triumph of reclamation. An important thing to know when entering LCSW, Rev. Sheri Heller’s comprehensive and analytically deep book, A Clinician’s Journey from Complex Trauma to Thriving, is that this is not a self-help book; it does not prescribe a process for healing complex trauma, except to emphasize the necessity for professional, skillful, and compassionate clinical therapy. With that understood, this truly insightful and informative book – a collection of individual articles addressing specific forms of complex trauma and its consequences – does much more than just describe the often-debilitating symptoms presenting from a wide variety of personal and social traumas. A testament to the richness of the information is the degree to which the reader is drawn into and held fascinated by the altered psychological realities presented here – the individual causes of which are due to some form of personalized, traumatic history. About one-third of the way into A Clinician’s Journey from Complex Trauma to Thriving, the reader, still fascinated but left hungry from all the highly informative yet appropriately emotionless discussion, finds LCSW, Rev. Sheri Heller providing a chapter (article) entitled An Orphan’s Memorial to her Dying Mother. After wandering through a complex but arid desert peopled sparsely with floundering, symptomatic victims, a tidal wave of emotion now engulfs and overwhelms the thirsty reader. The point of this wonderfully emotional chapter becomes ultimately that of the book itself (beyond creating a symposium for other therapists): to provide the necessary knowledge and a chance for self-recognition such that the unduly suffering soul might then consider the journey from complex trauma to thriving to be an identifiable, doable aspiration. Rev. Sheri Heller’s A Clinician’s Journey from Complex Trauma to Thriving is not a dry treatise on psychotherapy. The author is a practising psychotherapist and the book is a collection of articles on issues such as complex trauma, child abuse, PTSD, various types of addictions and personality disorders and offers means of recovery and treatment that may lead to cure and even mental and spiritual thriving. Yet, what makes A Clinician’s Journey an enjoyable read is the manner in which the writer touches issues that lie beyond the limits of her domain and yet have a bearing on our mental well-being. Rev. Heller judiciously uses the subjective and the objective by blending the clinician’s point of view with intensely personal experiences that do not appear out-of-place at all. In fact, those personal elements bring a delightfully sincere touch to what could have otherwise been a dry academic discourse on psychotherapy.For this reviewer the most impressive chapters of the book are those in which the author seeks to explain issues that lie beyond the immediate fields of practice of a clinical psychotherapist. Rev. Heller writes with a sense of delightful humour on ‘Geopolitics and the Psychopath’ and acknowledges that such historical realities as the brutality of war and suffering makes her turn to her ‘chosen field of psychology for answers’. She draws attention to the psychopathic traits observed in heads of state or high-ranking officials and analyses how such a psychopathic tormentor is often considered by the masses as their redeemer. The truth of her statement compels us to look around us in today’s world and nod in agreement. So true indeed! Elsewhere, Rev. Heller touches upon the ‘culture of avaricious materialistic consumerism’ and tries to make sense of how the greed of the richest may cause psychiatric symptoms ‘catalyzed by work environments akin to individual servitude’. In the same vein, she refers to modern social evils like ‘holiday madness’ and ‘holiday trauma’ and man’s delusional notion of his superiority over nature ‘as evidenced by….the callous plundering of the planet’. Thus, A Clinician’s Journey will not only make you ponder over the traumatic experiences that an individual goes through, it will also prepare you to think of the ills in our public life that often cause individuals or a group suffer from extreme pain and agony. A review of A Clinician’s Journey will remain incomplete without a reference to the author’s inherent goodness of heart she could barely keep hidden and her endeavour to help those who have been derailed from their ‘authentic self’ by the vicissitudes of life. It shines through her text time and again like that irrepressible sun on a slightly cloudy day. In a book dealing with some of the harshest and cruellest realities of the human condition that affect the mind, Rev. Heller’s sincerity of purpose is revealed when she dwells upon her faith in ‘a rich contemplative inner life’. For her, the liberating influence of man’s creative faculties are the best means to ‘undo the knots in us’ so as to make us more human. A Clinician’s Journey is written in an almost lyrical style with many references to literature which makes it such a readable book. Even a layman like this reviewer never wanted to put it down once he started reading. Every chapter of the book begins with a memorable and apt quotation that adds to the value of the book. A Clinician’s Journey is a great read but it could have been more so if a few repetitive lines (p. 147 and p. 181) could have been avoided and if it contained an index of technical words and phrases with explanations (like ‘gaslighting’ or ‘ambient abuser’). And, as an Indian, this reviewer would have liked to see the name ‘Gandhi’ (not ‘Ghandi’) spelt correctly everywhere. Highly recommended!